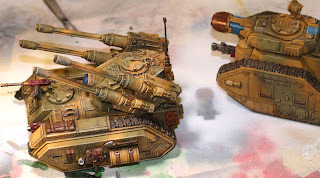 Why Speed Painting? 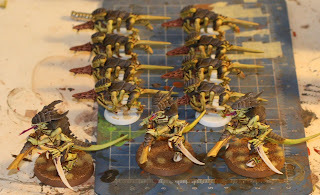 More Termagants and Warriors of Course! Since I am huge Blood Angles fan, here are some WIP Tyranids! 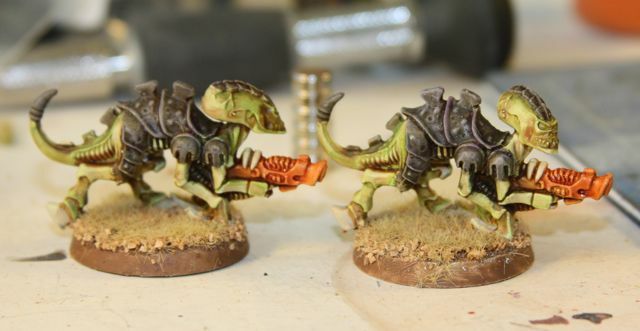 I have never played these guys, so I have no idea why I am madly painting the army. 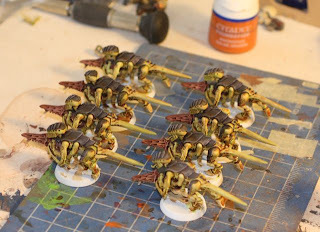 As I think about it, I don't think I ever played the first edition tyranids that started this for me. So why all the speed painting? I have no idea. 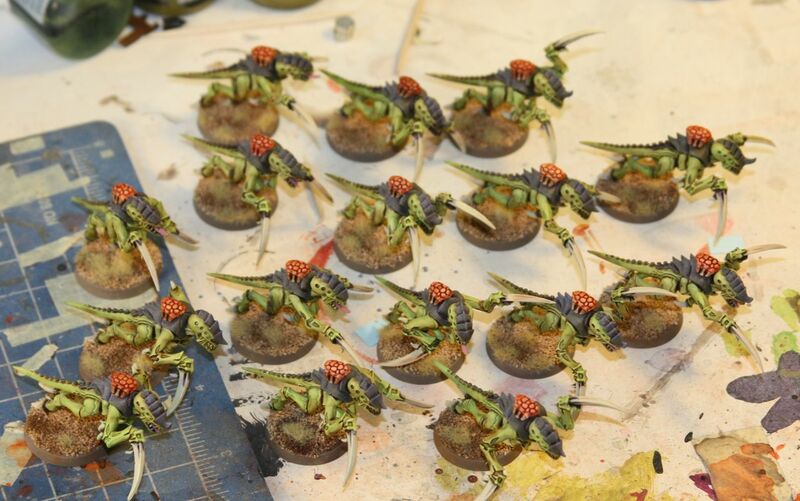 My rationalization is that I am really practicing my speed painting skills by working on the gazillion tyranids necessary for a list. The problem is that now I feel compelled to have a list. 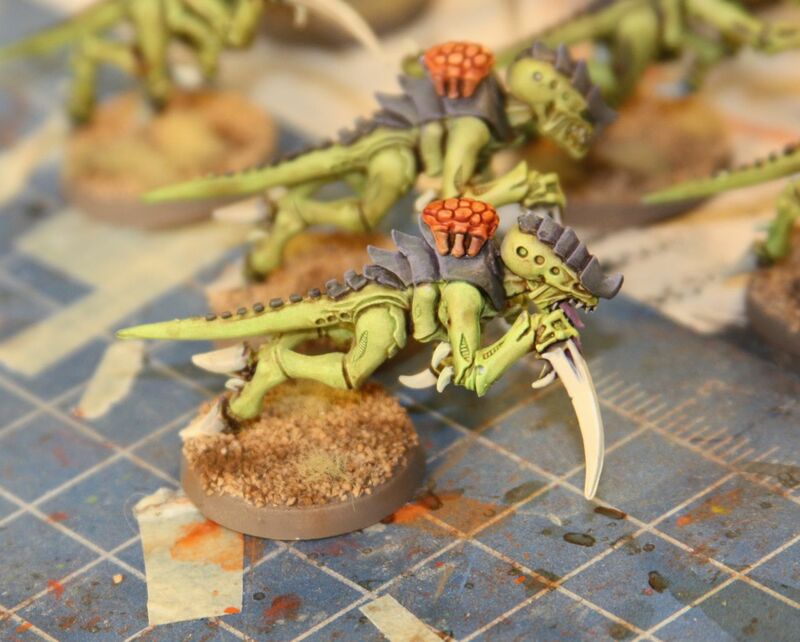 A side effect of this is that all of these tyranids are filling up my shelf space. Back to the most important thing, gun color. I tried foundation yellow and foundation brown on these guys, and think I will standardize on the three colors I have painted so far. Brown for the weird christmas tree guns, yellow for the warrior guns, and orange on whatever gun the regular gants have. I finally glued together a whole host of termagants and finally based my hormagaunts today. While gluing the brain pack things onto the hormaguants I decided to experiment with two old first edition termagants. I spent about 2 minutes on each miniature, not including time spent using a hair dryer, or time spent basing. 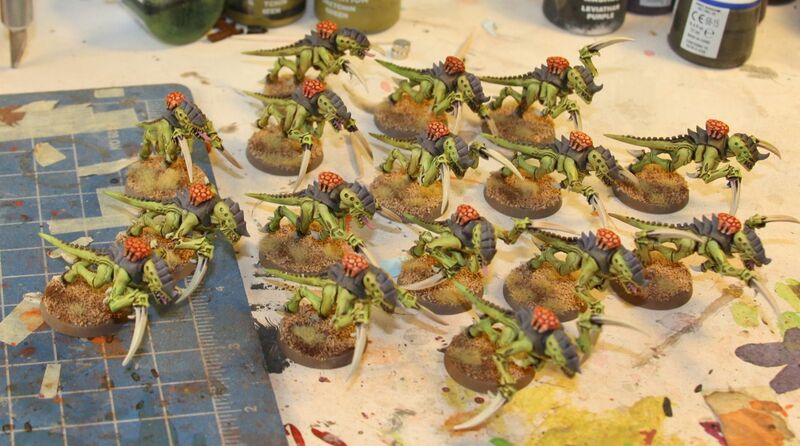 (yeah... the basing is pretty bad on these guys!) 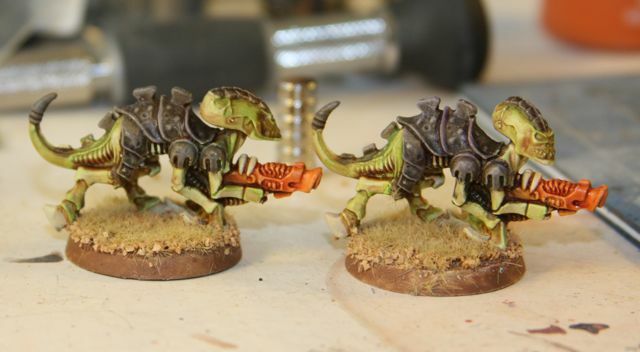 I don't exactly hate these old minis, but I can't put my finger on what I don't like about them. I do have about 50 of them, so if I were serious about playing the game it would be worth simple greening them and starting over. I think the old sculpts might detract from my aesthetic appreciation for the game. On a side note, anyone have a good color idea for the guns? I tried pink and was not thrilled, and am not digging orange that much. These are beginning to look like halloweennids to me. 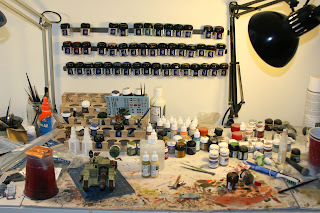 Seeing as how space was a premium on my painting table, my wife suggested that I buy some spice racks. This sounded like a good idea and we headed to the container store to pick up this as well as other home improvement items. The thing is, there were these metal strips and magnet packs that kept calling to me. 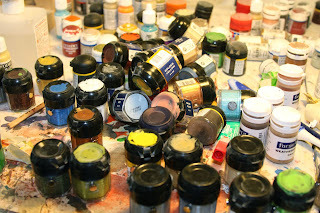 I know it seems insane, but I bought a bunch and busily glued magnets to a bunch of my paint pots. I probably need to buy a few more magnet strips, but I really like the way this is turning out. The paints are easy to see, reach, and out of my way unless I need them. The satisfying clunk sound they make when they click onto the wall is pretty cool as well. 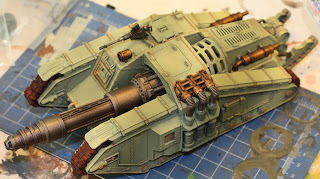 I just added a little bit of verdigris to the copper areas on the tank. I am regretting the wash around the metal plates a bit since it makes the tank a little messier than it was when I started. The decals are coming next. 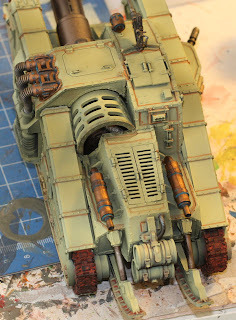 After all of that prep work on the resin, the valdor was ready to paint. I learned an important lesson last night. Stop being stubborn. Rather than keep putting foundation paints in my airbrush and having to deal with paint clogs every few minutes, I just picked up a different brand of paint and tossed it in. 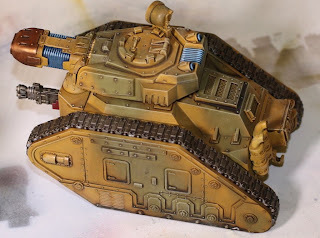 Granted the tank does not match my previous units at all, but I think a few Death Corps of Kreig insignia and it would fit right in. 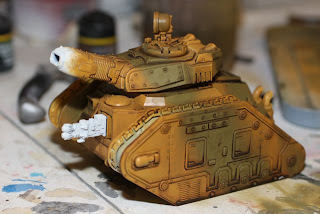 Resin is such a paint to build, but such a joy to paint. 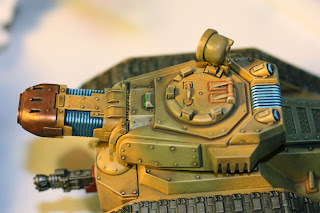 As usual there will be an abundance of posts as I slowly weather this tank up. 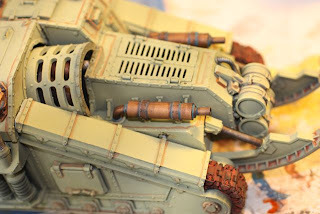 I decided to weather the tracks with forge-world weathering powders last night, and on a whim decided to try and use the powders like paint to cover the unpainted exhausts on the Russ. 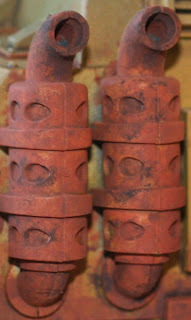 I used a wet brush to dab the rust powder on, and then mixed in soot colored powder for the exhaust tops. I really like the way it is looking, and am now trying to clean up the areas that I accidentally dabbed with the pigment. 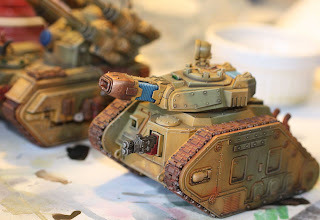 I have been slowly tackling the rust on the tanks. You can see my orange wash around the hatches and edges of the turret. I have not moved on to powders yet because of the mess. I just can't bring myself to start that stage until everything else is done. 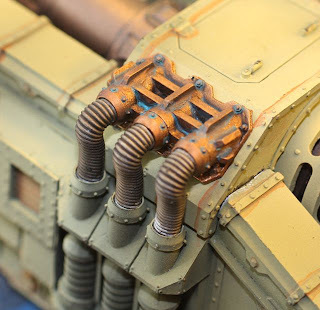 There is a special equation that goes along with forge world weathering powders. 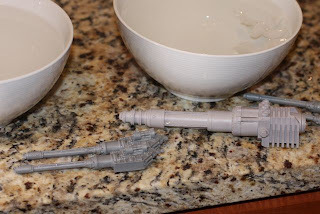 White Crate and Barrel Couch + Forge world weathering powders = impossible to placate wife! 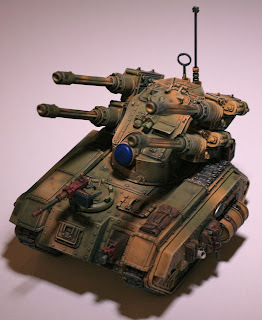 My wife suggested that I go play a game of 40k this weekend in order to relax from a stressful week at work. I suppose an army list is in order. 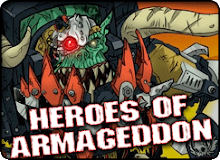 Shall I take out my deathwing, or show up with a lot of tanks. 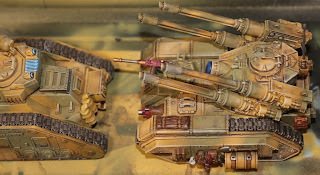 Both armies are easy to transport. Anyone game at the springfield va store? 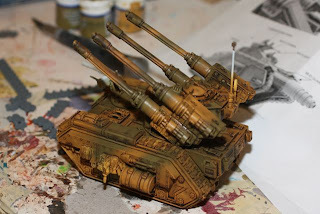 I have blocked in most of the color, and dry brushed the hulls of the tanks. I deviated from my normal pure dehneb stone dry brush and mixed in yellow for the yellow parts, and then green for the green parts. 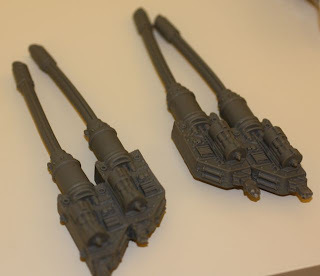 The slight tinting of the paint really helps the models stand out. I wish I had done this for all of the tanks. These still fit in, but have a little more pizzaz. 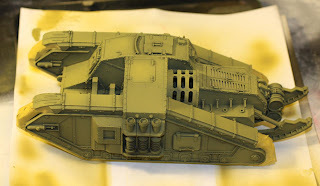 I still have all of the layering to do on the red, and canvas portions, as well exhausts, but at least there is not primer left on the models. 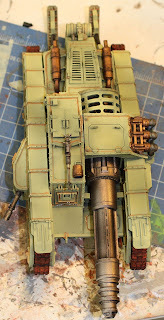 I am really happy with the plasma turret, and it was surprisingly easy to do. So after all of these tanks, I wonder if I can still paint a mini. 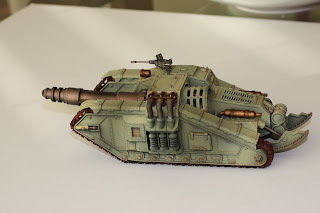 The Valdor tank hunter's tracks bewilder me, so I decided to give the Hydra a shot. It turns out the hydra does not fit together very well, so there is a full 1/2 inch gap on the bottom of the tank. It took me over an hour to come up with a compromise that made it kind of fit together. the top hatch simply is not wide enough, and appears to be too long as well. 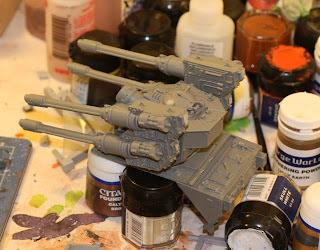 The one thing that did work out is the magnetizing of the autocannons. 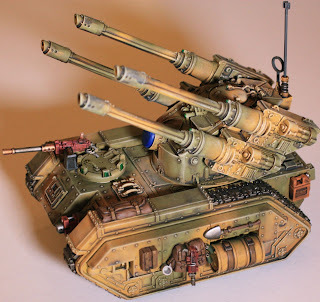 I might build a missile rig so I can field a manticore using the same chassis. Should the Valdor follow the same recipe? 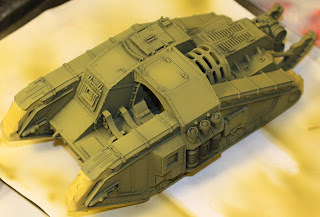 Is the fact that it is supposed to be a dark age relic enough to give me reason to paint it light blue and grey. I am undecided about this. My force has all kinds of troops, but the tanks have so far been consistent. 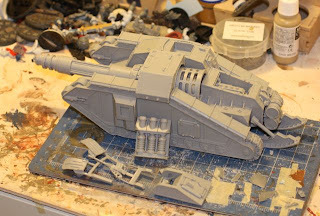 While away on travel I received an order from forge world containing my first all resin kit. I've purchased upgrades before, so I knew I was getting into something difficult with this one. 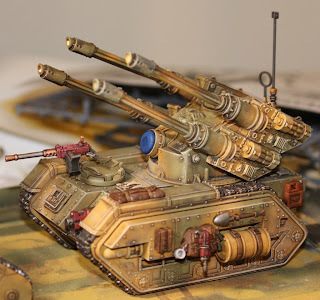 The valdor is supposed to be a venerated dark age of technology vehicle according to the books, and has a nice retro-ww1 tank meets 1950s robot future thing going on. 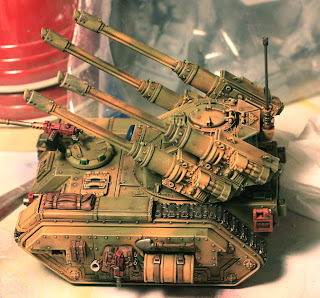 My order contained a hydra-flak tank as well, but it just does not have the same visual interest as the valdor to me. dip the re-formed resin into the ice water to set the shape. So I have a whole lot of parts to slightly bend into shape. 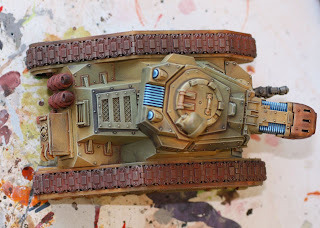 I think the tank is going to take far less time to paint than the preparation!